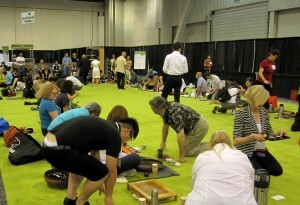 This year the Expo has moved to the North Building of the Las Vegas Convention Centre. The orientation was confusing, but once I got my bearings and a cup of Oriental Beauty from Teas Etc. tea break lounge, I was in my happy place. I scurried back downstairs between sessions to see who had arrived. Now here is why WTE is so important to me socially. All year I’ve been following and tweeting along with the tea community, becoming familiar with people’s profile pictures, never sure that I would meet these “friends” in person. I knew that Lisa Kunizaki of Chambre de Sucre was attending the Expo and I felt confident that we’d connect at some point on the weekend, but there she was walking past me. She was exactly the exuberant, lovely entrepreneur that I had imagined and we hugged like long lost friends. It was great. Meanwhile, the inimitable Jane Pettigrew’s tasting workshop Understanding Puer Tea was about to begin and the line up was growing. Pettigrew always attracts a full house and this was no exception. Puer is a complicated tea and I’ve read many online articles attempting to explain its formulation. 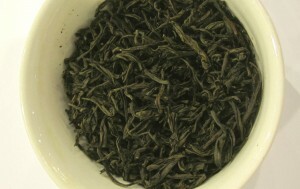 Jane confidently talked about the history of “dark teas” with origins in the 10th and 11th centuries. Cake style tea was transported to the minorities on China’s borders, specifically Tibet and Mongolia in exchange for horses. Puer is specific to a location, Xishuanbanna, Yunnan, known for ancient arbour trees. Puer tea is now location-protected similar to Darjeeling tea. Pettigrew introduced her guests to Professor Kanzo Sakata ,Institute of Chemical Research at Kyoto University and Lui Di of Jin Damo Tea Co. Yunnan. The professor explained the difference between Shu Puer – traditional method, aged for 5 – 10 years and Sheng Puer where water is added to speed up the microbial action in a controlled factory setting. I have a new attitude toward this “cultured” tea and will revisit the puers that I have at home with a new appreciation. I had to exit before the actual Puer tasting unfortunately, but I heard that it was a privilege to taste the rare teas that were presented . I departed Jane’s tasting prematurely in order to catch what was left of Steven Downer’s presentation: Steampunk and Alt Culture in your Tea House. I don’t know if I’ve been living in another universe, but I had never heard of this post modern phenomenon. Think Victoria meets Mad Max. 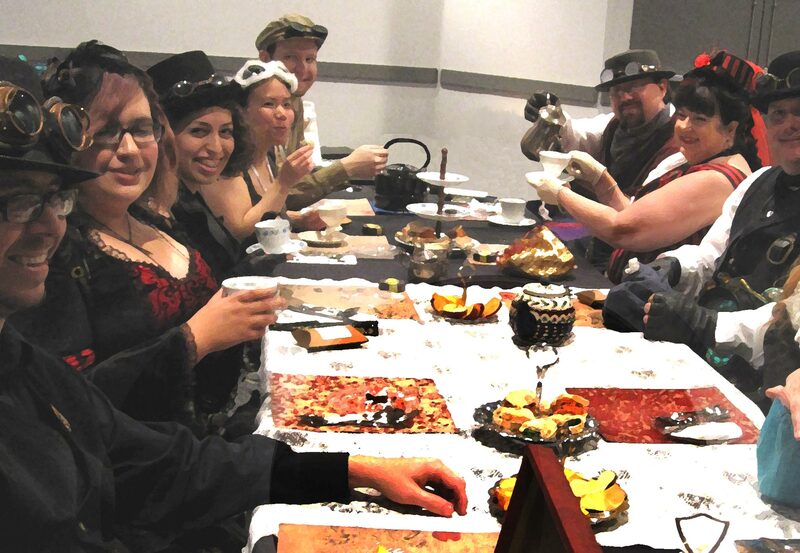 Steven had invited the local Las Vegas Steampunk Tea Society to come and have tea. 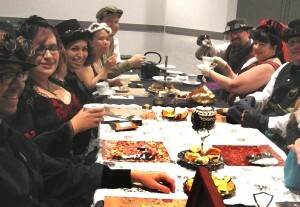 Steven and his wife Jenny brought their Steampunk tea party paraphernalia with them all the way from Fairbanks Alaska. 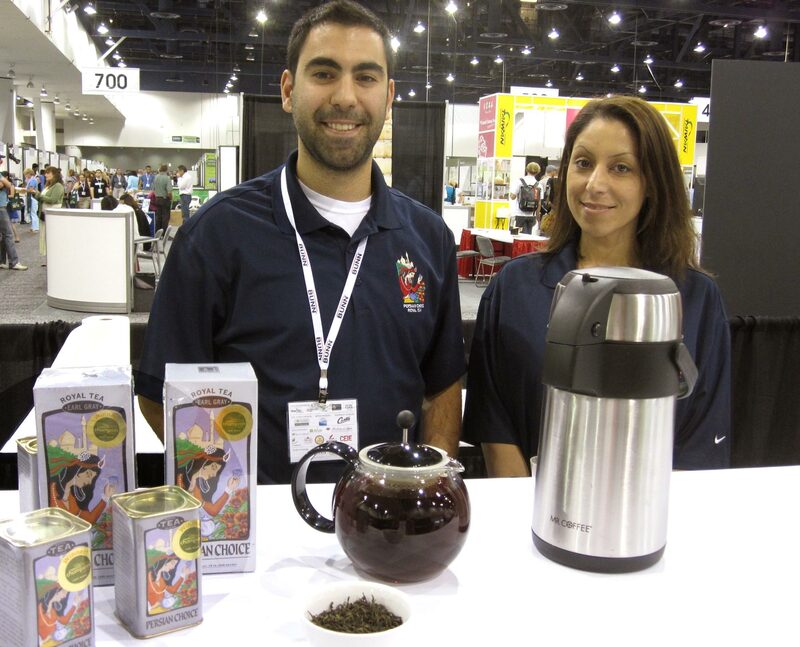 At North American Tea Championship Winners Tasting Circle for Black Teas I met Hovik Azadkhamian whose family company, Alvin’s, has been in the tea business since 1976. Hovik is third generation of coffee roasters and tea blenders. Their Earl Grey was subtler than most but delivered its bergamot beautifully. The Korean Pavilion was a destination for me as I will be travelling to the enchanting country in August. 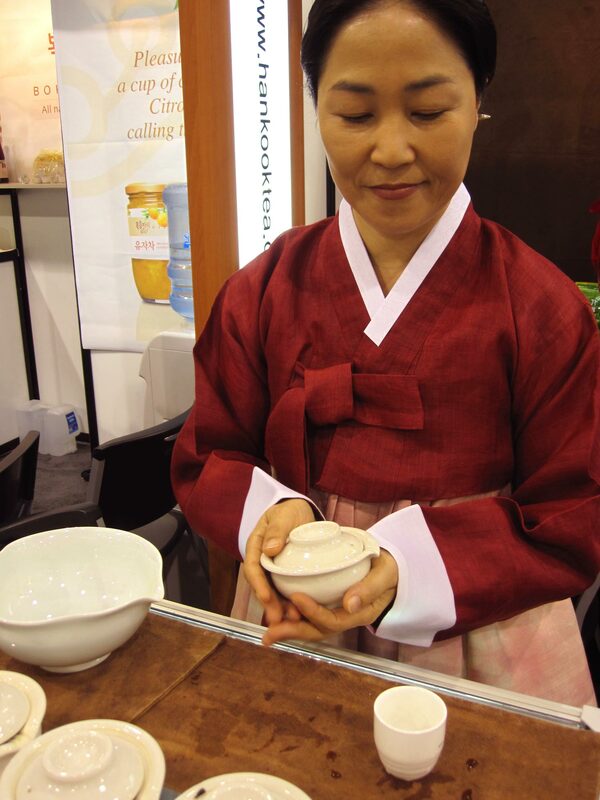 The Korean delegation presented some lovely green teas and I was surprised at the bamboo teas on offer. 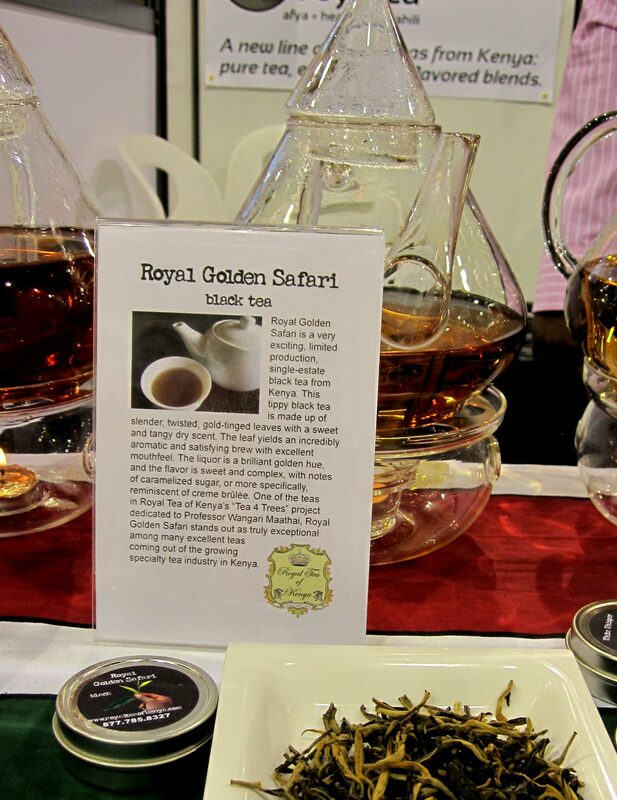 Joy M. W’Njuguna was back with her Royal Tea of Kenya. I tasted Royal Golden Safari a new delicious golden tippy long leafed black tea. Her grandfather Arthur Njuguna Komo is now 111 years old! Read more about the tea from last year’s post. 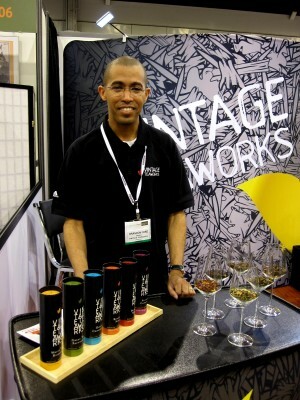 Brandon Ford from Akron Ohio has been a wine lover and educator for 10 years and a tea lover all his life. He is on his way to tea mastery through the STI program. The Expo is his “hello world moment” as he presents his new concept “Vintage Teaworks” with blends such as Green Tea Sauvignon and Black Tea Merlot. My fave – Oolong Chardonnay. Occasionally I find myself engaging with vendors for longer periods because I am passionate about their product. 1660 London and its creators Peter Ting and Lu Zhou delighted me with stories of the creation of their brilliant tasting cups. 4 years from original concept and they are ready to market here at WTE. Both designers are located in London UK. Peter a ceramic designer and Lu a graphic designer and tea expert. After a recent prestigious launch at the Victoria and Albert museum they have been happily overwhelmed by the positive response here at the expo. I will be writing a piece in more depth about this interesting product and Peter’s journey to develop it. The first Wu-Wo Tea Ceremony took place in an open space at the back of the exhibit hall. A large group of individuals brought their tea equipment and prepared in silence for those beside them. It was unique to watch and because it is so new to people I’m sure it will grow and improve if it is featured again next year. Packing up now and ready to head out to Day 2. Check back in tomorrow! How could you possibly go wrong with a tea that has the words Oolong and Chardonnay combined!? Sounds delish! 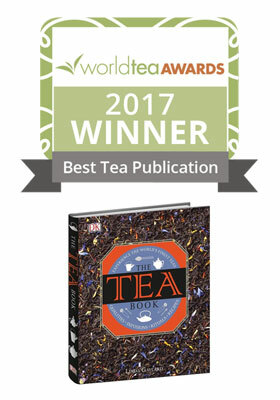 I tasted the teas from Vintage Teaworks and spoke with Brandon Ford and I believing he is a rising star in the tea business. Is there a website for VIntage Teaworks yet? As far as I know Brandon will be launching a site very soon. I will be in touch with him soon and get that info. As soon as I know I’ll add the launch date to my post.